WGN, Chicagoland’s bestest buddy to the news, recently reported a story on an app called Expunge.io. The app helps bebes kids erase potential criminal records from online job searches and the like. Naturally, reporters are always looking for a demonstration to record on tape. And because reporters are “public facing” and aware of the freaks of the world, said reporter will call on a lowly associate producer for off-camera demos. Sweet, right? You get to cuddle up to the big-time reporter and show that you are on-the-spot for anything said reporter needs (outside of the usual trekking across the city for dry cleaning). The B-roll of the reporter was a tad more revealing than the reporter cared to happen, as this report as gone viral for all the wrong reasons. No one cares about the app. No one cares about the report. 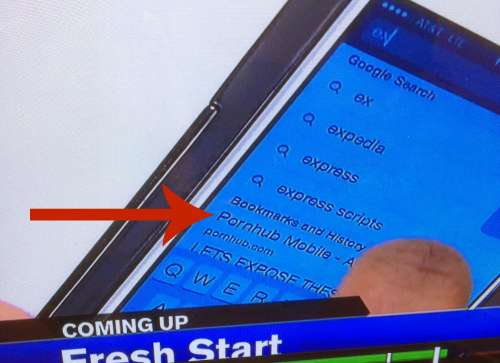 They do care about the archived search history on said producer’s phone. Whoops! Hope his mother wasn’t watching.